While everyone considers Ruth an unworthy outsider, she is shocked to find the owner of the field-one of the wealthiest and most honored men of Judah-is showing her favor. Long since a widower and determined to stay that way, Boaz finds himself irresistibly drawn to the foreign woman with the dark, haunted eyes. He tells himself he is only being kind to his cousin Naomi's chosen daughter when he goes out of his way to protect her from harm, but his heart knows better. 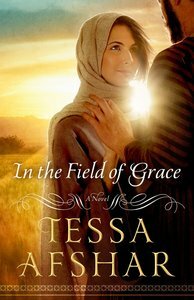 About "In the Field of Grace"
Customer Reviews For "In the Field of Grace"
"In the Fields of Grace" was an enjoyable novel. Tessa Afshar brought to life the story of Ruth and Naomi in the Bible. She describes both of their journeys with detail. The book is based on the original story from the Bible, however, Tessa builds the story with fiction and imagination. The book communicates God's hope in our circumstances and is an encouraging book to read. If you need to be encouraged and uplifted this a book for you. It was a joy to read! As with other biblical fiction, the story from the bible is told with other plausible details and some extra historical context. The book of Ruth is a beautiful love story on its own and I felt a bit defensive as I first read this as I did not always agree with some minor literary choices that Tessa Afshar made. As a whole, I really enjoyed this novel and was impressed with its final focus on biblical truths and the surrender of our lives to God's will (when we so want to control things ourselves). The Epilogue ties the purpose of the book of Ruth in beautifully. Wow. "Not just another story written about Ruth and Naomi"
In this book "In the Field of Grace" Tessa Afshar brings the story of Ruth and Naomi, and the beautiful love story between Ruth and Boaz to life. Tessa Afshar is a writer who through her details of life for these women in the land of Judah transports you to that time, and the reality of the struggles they would have faced. One of those books you just can't put down. Highly recommend. I enjoyed reading Fields of Grace and recommend it, especially for young adult women who are in a relationship or thinking of starting a relationship. The author has reminded us of what true love, faith and that placing God first in a relationship is important today just as it was so many years ago. The author brings the beautiful story of Boaz and Ruth to life and captures their love and faith in a heartwarming way. I never wanted the story to end.